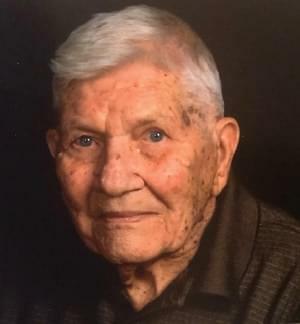 Clarence “Sonny” Altenbaumer, 97, of Central City, passed away Thursday, April 11, 2019 at the Centralia Fireside Nursing Home. Sonny lived his whole life in Central City with the exception of the winter months, where he spent in Zephyrhills, Florida. He was a Centralia Township High School Graduate. He served in the U.S. Army during WWII , where he was wounded and received a Purple Heart. Sonny worked as a Meat Cutter and he also worked for the U.S. Postal Service. He was a member of the Zion United Church of Christ in Centralia. He enjoyed camping with the Raccoon Rambler’s Camping Club. Sonny loved the time he spent with his family and he was an avid St. Louis Cardinal’s Fan. Funeral Services for Clarence “Sonny” Altenbaumer will be held Monday, April 15, 2019 at 1:00 PM at the Sutherland-Garnier Funeral Home in Centralia with Rev. Nancy Peebles officiating. Burial will follow at Mt. Evergreen Cemetery in Central City. Military Honors will be accorded at the gravesite by the American Legion Post 446 and V.F.W. Post 2055. Visitation will be held Monday afternoon from 12:00 PM to 1:00 PM at the funeral home. Memorial donations may be made to the Zion United Church of Christ and will be accepted at the Sutherland-Garnier Funeral Home at 235 North Sycamore Street Centralia, Illinois 62801, (618)532-3523, who is honored to be of service to the Altenbaumer Family. Online condolences may be made to the family by visiting www.sutherlandfuneralhome.com. Sonny is survived by four children: Sharon Martin and Al Bratten of Carbondale, Gary Altenbaumer and wife Cindy of Centralia, Kevin Altenbaumer and wife Donna of Centralia, and Susan Baumgartner and husband Stan of Centralia; eight grandchildren: Chad Altenbaumer of Centralia, Christie Nehrt of Swansea, Colbie O’Neel of Van Burensburg, AR, Jeff Martin of Marion, Jason Altenbaumer of Hoyleton, Kristopher Altenbaumer of Carlyle, Matt Baumgartner and Megan Baumgartner both of St. Louis, Missouri; seven great-grandchildren; a special nephew: Jerry Cunningham and wife Sue of Florida and several nieces and nephews. Sonny was born July 25, 1921 in Central City, son of Edward Altenbaumer and Emma (Curdt) Altenbaumer. He married Opal Heironimus in St. Louis, Missouri and she preceded him in death on September 27, 1988. He married Betty (Farver) on May 25, 1991 and she preceded him in death. He was preceded in death by his parents, two wives: Opal Altenbaumer and Betty Altenbaumer, two brothers: Leslie Altenbaumer and Ralph Altenbaumer, and two sisters: Viola Yoos and Edna Yauch.